Russell Eponym and Ex-FM Radio at Ce Soir TODAY – Ce Soir Arts – Be inspired tonight! At 3 PM SLT, RUSSELL EPONYM returns to Ce Soir with his enchanting Folk, blues and beyond. Always a delight, Russell brings velvety vocals and a lovely finger-picking style of guitar to his set. He has quite a repertoire, and you might hear a little Donovan, a little Dylan…and you’re most certainly in for a treat when he shares with us some of his own original compositions. Russell‘s music is appreciated and enjoyed across the grid, and we are always pleased to have him in at Ce Soir. Do join us for the inimitable Russell Eponym – The Music Whisperer – as he brings us folk, blues and beyond…and so much more! 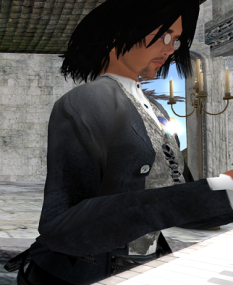 Then, at 4 PM SLT, musicologist Experiment Rhode steps in with his Ex-FM Radio Show, broadcasting LIVE from Ce Soir. This fresh take on the SL airwaves is a must-hear, as Ex shares his varied and extensive music collection – and his amazing grasp of popular music history. Today’s theme is “Singer-Songwriters of the 1970s,” and we can’t wait to hear it! Come along and enjoy as Ex deepens our knowledge of music and musicians; it’s great education and entertainment, rolled into one! Join us today, 4-6 PM SLT. NOTE: JordanReyne Deezul will return next week – 22 March at 1 PM SLT. We shall miss her today, but look forward to her next show!